The priority for flying-fox management should be recovery of threatened species and protection of ecosystem health. Killing flying-foxes undermines ecosystem health and resilience to climate change, due to reduced pollination and seed dispersal of native trees. There have been massive declines in flying-fox populations since European colonisation due to land clearing and large-scale slaughter. Two species, Grey-headed and Spectacled flying-foxes, are listed as nationally threatened (vulnerable under the Environmental Protection and Biodiversity Conservation Act 1999). In 1938 biologist Francis Ratcliffe estimated there were “many millions” of Grey-headed flying-foxes, and that they had already suffered a 50% decline. Now there are an estimated 400,000 or so. They were listed in 2002 due to evidence of a 30% decline in numbers in the decade from 1989. Significant threats for both the Spectacled and Grey-headed flying-foxes include habitat loss, mortality in orchards and camp harassment. Because of low reproductive rates, flying-foxes are susceptible to population declines. With females able to bear only one young a year and generally not reproducing until they are 3 years old, they have a low capacity for population increase. It is biologically impossible for flying-foxes to build up to “plague” numbers. Population stability requires high survival rates of adults and juveniles. A mortality rate exceeding 12 percent may cause the population to decline. An imposed mortality as low as 10% in addition to natural mortality can lead to rapid decline of a large population. In addition to orchard killing and habitat destruction, flying-foxes suffer from seasonal or climatic food shortages, entanglements in barbed wire and backyard netting, powerline electrocutions, heat stress (Grey-headed flying foxes), and paralysis ticks (Spectacled flying foxes). Flying foxes are vital for pollination and seed dispersal of many native trees. Long before species are recognised as threatened, they may become functionally extinct, as populations decline below the threshold necessary to contribute significantly to seed dispersal or pollination. As long-range pollinators, flying-foxes promote genetic flow between eucalypts and other Myrtaceae at greater distances apart (> 5 km) than most other pollinators. Spectacled flying-foxes feed on fruit of more than a dozen rainforest species for which no other seed dispersers are known and can spread ingested seeds up to 80 km away. Such long-range capacity for spreading pollen and seeds is very important to genetically re-link habitats fragmented by clearing. As long-range pollinators, flying-foxes are expected to play an important role in facilitating climate change adaptation by eucalypts, paperbarks and other Myrtaceae. By carrying pollen tens to hundreds of kilometres flying-foxes can spread the genetic potential to adapt to higher temperatures and aridity. Ever since European colonists planted fruit trees, flying-foxes have been killed for their fruit-eating habits. Until recently, tens to hundreds of thousands were killed most years by shooting raids on camps or shooting, electrocution and poisoning in orchards. For several decades in the 20th century a thrupence bounty was offered for dead flying-foxes. In the Brisbane and East Moreton district alone, bounty claims were made for about 600,000 dead flying-foxes in the two decades from 1925. Even when flying-foxes were granted legal protection in Queensland from 1974-1985 and then from 1994, large numbers were killed under licence or illegally in orchards. Flying-foxes are typically at their most vulnerable when they are killed in orchards. They most often seek food in orchards when other food is scarce due to climatic events (eg. storms or drought) or seasonal shortages due to clearing of their most productive food sources. The majority of flying-foxes shot in orchards are lactating and pregnant females, which has the greatest impact on population levels. For every lactating female killed, a juvenile flying-fox dies as well. Electrocution: Electric grids are large-scale killers. Electrocution was banned as a method of crop protection after a court case initiated by a conservationist found that electric grids on one property in north Queensland had killed probably more than 18,000 Spectacled flying-foxes in just a few weeks and would endanger the species within 5 years. In another case, a fruit grower admitted to killing tens of thousands over a decade without a permit. The Liberal National Party has refused to rule out a return to the use of electric grids. Enforcing any limit to flying-fox killing in orchards is costly (borne by taxpayers) and difficult. The environment department has neither the resources nor the legal powers to monitor killing on private properties. It is far easier to enforce laws if all shooting and killing of flying-foxes is illegal. From 2002-2007 the Queensland Government imposed a quota for the number of flying-foxes that could be shot under permit. But growers could reach their monthly quota (of 15-30, depending on the species) in one or two hours of shooting. While shooting is generally not very effective for crop protection, shooting on average just 0.5-1 flying-foxes a night, as required under the quota, is totally ineffective. With little chance of being caught, many growers would have exceeded their permit numbers. In 2006 after an investigation of enforcement failings associated with flying-foxes in orchards, Queensland's Ombudsman concluded, "Sufficient evidence exists to question the ongoing viability of the DMP [Damage Mitigation Permit] system for flying-foxes." The most common lethal method of crop protection is shooting. Even when there were no legal limits on the number of flying-foxes farmers could kill, they found that it was ineffective. Over a fruit season of 6-8 weeks, even if a grower shoots only a few flying-foxes a night, the tally in one orchard can be several hundred. Multiplied over a region the tally can be many thousands. Overall, there is a great deal of evidence that megachiropterans, and particularly flying foxes, play a vital pollination role in forest ecosystems in Australia. In Australia, flying foxes and tube-nosed fruit bats may be the only seed dispersal agent for many rainforest trees, and therefore play an important role in the long-term survival of some tree species. Grey-headed flying-foxes are dying younger and reproducing less often than had been assumed. In the populations sampled, the age of first reproduction generally wasn’t until 3-4 years, and fewer than 3% were more than 10 years old although the oldest was at least 16. The estimated rate of mortality across all age groups was 35%, higher than any previous estimates of adult mortality. Research on Spectacled flying-foxes at the Tolga Scrub colony in north Queensland found a similar pattern. Most females did not reproduce until they were 3 years and 96% died by 6 years of age. This means there is very little time between the beginning of the major reproductive phase and the probable end of life. Flying-foxes can bear only one young a year. The annual mortality rate in 2001 and 2002 of 35% was double the level that would maintain a stable population. If long-range pollinators are protected, eucalypt genes that confer adaptation to aridity could circulate widely. The most important pollinators may be those that travel furthest. Flying foxes and birds often fly very large distances and carry far more pollen on their bodies than insects. During recent trials on a new flying-fox deterrent system in orchards in northern NSW, it was established that most orchardists would cull approximately 20-30 flying-foxes each night during the harvest season (6 weeks) ... this equates to 840-1260 flying-foxes killed per orchard per season. Table notes: * It is a condition of licenses that returns specifying the number of flying-foxes killed be submitted to the government. This figure is based on those returns, and does not include flying-foxes killed illegally. # Permits issued to shoot different species of flying-fox by the one fruit-grower were counted as separate permits. Some growers also received two consecutive permits for one month each. In 2006-07, 122 permits were issued to a total of 37 individual fruit growers or companies. Ratcliffe F. (1932) Notes on the fruit bats (Pteropus spp.) of Australia. Journal of Animal Ecology 1: 32-57. McIlwee A, Martin L. (2002). On the intrinsic capacity for increase of Australian flying-foxes. (Pteropus spp., Megachiroptera). Australian Zoologist. 32: 76-100. Divljan A. (2008) Population Ecology of the Grey-headed Flying-fox, Pteropus poliocephalus:A study on the Age-Structure and the Effects of Mortality on a Vulnerable Species. PhD thesis. School of Biological Sciences, University of Sydney. Fox S, Luly J, Mitchel C, Maclean J, Westcott D. (2008) Demographic indications of decline in the spectacled flying fox (Pteropus conspicillatus) on the Atherton Tablelands of northern Queensland. Wildlife Research, 35: 417-424. McConkey K, Drake D. (2006) Flying foxes cease to function as seed dispersers long before they become rare. Ecology 87(2): 271-76. Eby P. (1996) Interactions between the Grey-headed Flying-fox Pteropus poliocephalus (Chiroptera: Pteropodidae) and its diet plants - seasonal movements and seed dispersal. PhD Thesis, University of New England, Armidale, NSW. 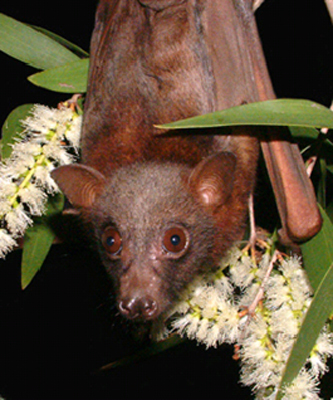 Birt, P. (2005) Mutualistic interactions between the nectar-feeding little red flying fox Pteropus scapulatus (Chiroptera: Pteropodidae) and eucalypts: habitat utilisation and pollination. PhD thesis. University of Queensland, Brisbane. world heritage values of the Wet Tropics World Heritage Area. CSIRO Sustainable Ecosystems and the Rainforest Cooperative Research Centre, Atherton,Queensland. 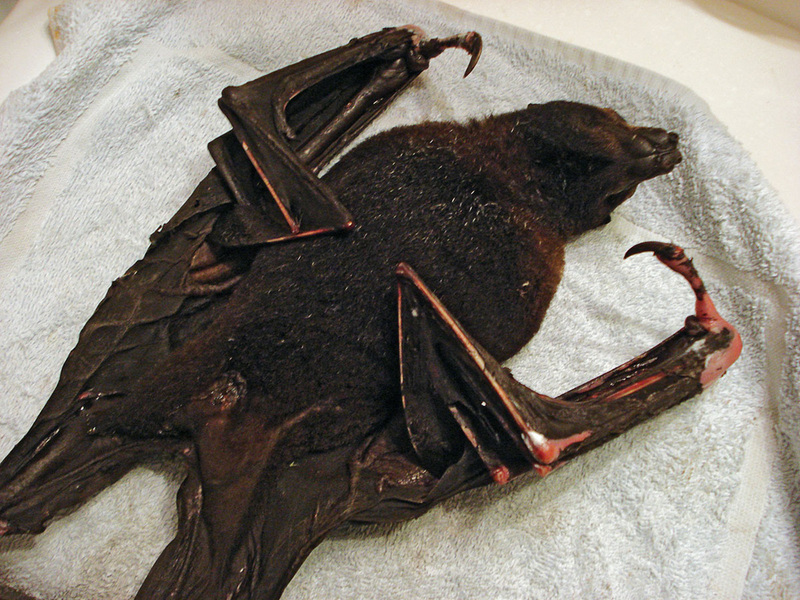 Westcott, unpublished data, cited in Queensland Department of Environment and Resource Management (2009) National recovery plan for the spectacled flying fox Pteropus conspicillatus. Report to the Department of the Environment, Water, Heritage and the Arts, Canberra. Hall L, Richards G. (2000) Flying Foxes: Fruit and Blossom Bats of Australia, UNSW Press, Sydney. Parry-Jones, K.A. and Augee. M.L. 2001. Factors affecting the occupation of a colony site in Sydney, New South Wales by the Grey-headed Flying-fox, Pteropus poliocephalus (Pteropodidae). Austral Ecology 26: 47-55. Wahl D. (1994) The management of flying foxes (Pteropus spp.) in New South Wales. MSc thesis. University of Canberra, Canberra. Richards G. (ed) (2000) Proceedings of a Workshop to Assess the Status of the Grey-headed Flying Fox. Australasian Bat Society, Canberra. McLachlan B. 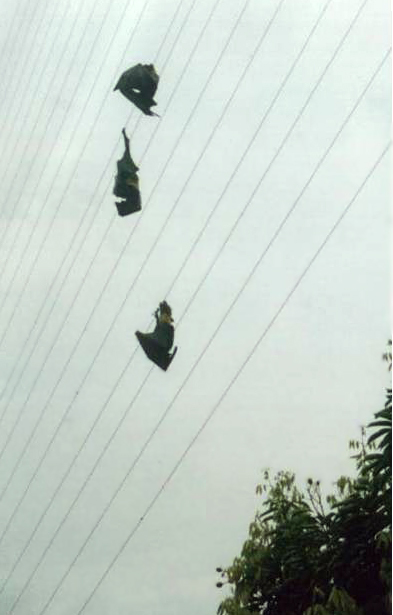 (2002) NPWS Operational management of commercial crop damage by flying-foxes – licensing in practice a far north coast perspective. Pp. 80-83 in Managing the Grey-headed Flying-fox as a Threatened Species in NSW, edited by P. Eby and D. Lunney. Royal Zoological Society of NSW, Mosman, NSW. Waples K. (2002). Review of the NPWS policy on the mitigation of commercial crop damage by flying-foxes. Pp 39-46 in Managing the Grey-headed Flying-fox as a Threatened Species in NSW, edited by P. Eby and D. Lunney. Royal Zoological Society of NSW, Mosman, NSW. Ballard G. (2004). The Human Dimensions of Grey-headed Flying-fox Management: surveys of NSW commercial fruit growers and the public (2003-2004). A report to NSW Dept of Environment and Conservation, Sydney. Booth v Bosworth, Booth v Frippery, Booth v Yardley. Wahl, D. E. 1994. The management of flying foxes (Pteropus spp.) in New South Wales. MSc thesis. University of Canberra, Canberra. Letter from Queensland Ombudsman to Carol Booth, April 2006. Thomas M. (2005) A Fruit Bat Deterrent System. Evidence in Booth v Frippery. See EDO Website for an account of the court case.